Is Your Brain Tricking You To See This Dress As White? Almost one and a half year back, this dress broke the internet and it was all over our social media news feeds. This dress was by Roman Originals and it was posted on Twitter in February and retweeted by Taylor Swift. Everyone had the same question about this very dress and that was, what color this dress is? Some people perceived it as blue and black dress while others perceived it as white and gold dress. There were huge debates and fight going around among people trying to prove the color of this dress according to their own perception. The debate lasted for quite a long time before another picture of this dress was revealed and answer was known. It turned out to be black and blue and not white and gold. After this whole era of chaotic debates of color of this dress, scientists tried to find out the reason behind perceiving it as white and gold. A whole research was conducted for the purpose. The subjects who had different views about the colors of the dress went through MRI procedure to find out if there was any difference between brain function of two group. The answer was yes! There was a difference. 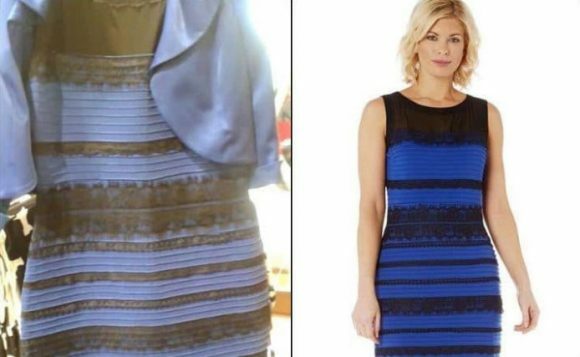 People who were perceiving the dress as white and gold had some extra active brains. The extra activity was actually localized to the frontal lobe of the brain which is the part which is associated with visual perception, mental reasoning and selective attention. A little parietal lobe was also involved. So the reason for altered perception was this extra activity in their brain which was a result of trying extra hard to make a sense out of colors of the dress. “Based on the research findings, we were able to quantify the brain areas involved in the process, thus we have laid a foundation for further research in the field of visual processing,” said a professor who was a researcher at the University Clinic Bergmannsheil in Bochum. The color perception can differ from one person to another because it is your brain which decides the color when light hits retina and signals get transmitted to the brain. Colors are differentiated just by wavelengths that get longer on one side of spectrum and shorter on the other side. These different wavelengths when strike the retina, your brain cleverly converts them into the colors according to its own perception. That is why, color perception can vary from a person to another. Brain actually see that how illuminated the color is by the light around it and subtracting that from the ‘real’ color. This is what makes us able to differentiate colors in bright day light and at night. Usually, the brain efficiently assesses the level of light and perceives the color. However, sometimes brain can get confused and this is what happened in case of Roman Originals dress. In the picture of the dress, there was shadow on the dress while background was bright. This is what made brain confused about how much color it should add or subtract. Following is what Andrew Hanson, scientists at the National Physical Laboratory had to say. Those who said that color was black and blue didn’t do any extra work and just said what they could see in front of them. However, the ones who said white and gold actually made their brains work extra by thinking that there was a shadow. WHAT DOES THIS COLOR ADAPTING OPTICAL ILLUSION REMIND YOU OF? WHILE YOU PONDER IT, CHECK OUT THIS AWESOME STRAWBERRY OPTICAL ILLUSION!